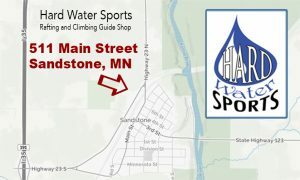 Hard Water Sports has a new climbing and rafting guide shop in Sandstone, MN. 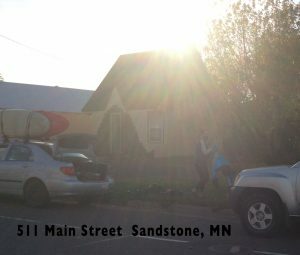 Located in downtown Sandstone, we are super close to the Kettle River whitewater and to the rock and ice climbing in Robinson Park. We are super excited to be our new location. 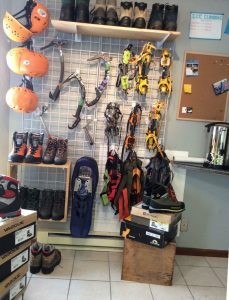 The shop will stock a small amount of new and used climbing gear, we have rental ice climbing gear, and the shop will be used as a meeting place for guided climbing adventures and Kettle River rafting tours. Rent ice climbing gear in Sandstone, Minnesota. Yes, you can rent crampons, climbing boots and ice axes at our guide shop. We are just 2 minutes from the Sandstone Ice Park and we have everything you’ll need for an ice climbing adventure. Read more at Ice Climbing Gear Rental. In our small guide shop we have a small amount of climbing and paddling gear for sale. If you’re in need a rope or a life jacket we can help you. The main use of our 511 main Street guide shop is for an adventure base for whitewater rafting tours and our guided rock and ice climbing. 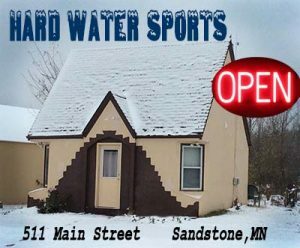 511 Main Street, guide shop, kettle river rafting, minnesota ice climbing, minnesota whitewater, sandstone mn. Bookmark.